For most wedding guests, the cake is the highlight of the party. Layers of buttercream frosting and snow white cake have been the standard sweet component of wedding celebrations for generations, but today’s couples are branching out with a few new takes on the classic. Instead of serving slices from one large cake, try mini cakes. These individual servings of cake, decorated just like a full size layer cake, are a fun sized treat that guests will talk about long after the last dance. Fashion influences more than clothing. 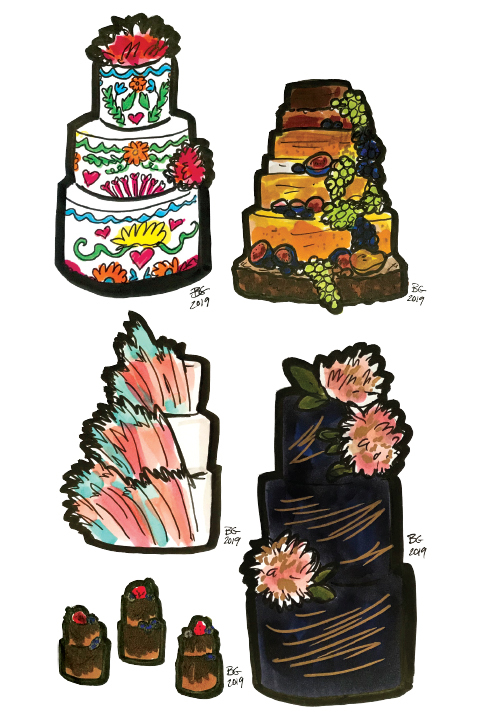 Cakes piped with large florals to resemble traditional Mexican embroidery are becoming more popular among offbeat couples wishing to incorporate color and whimsy throughout their big day. Drop the caramel sauce. This is not the cheesecake you would expect. Born from the low-carb craze, wheels of savory cheddar, brie and camembert are stacked to create an elegant wedding-themed variation on the cheese board. Add vibrant fresh fruits and herbs for pops of color and flavor. Turn an ordinary cake into a work of art with a brushstroke cake. Strips of colorful melted white chocolate are painted and then cooled before they are added to these showstopping cakes. The colors can be switched up to match any theme. Art gallery wedding, anyone? That’s right. Black icing. At a wedding. Nothing says high drama like dark colors with touches of metallic. To keep this trend from staining guests’ teeth and ruining photos, stick to airbrushing any dark coloring on top of a white icing base.